I would like to thank the good motorists of Roy, for a pleasant morning. I rode the Denver and Rio Grand rail trail from Clinton to West Haven through Roy at the morning rush. At each of the half-dozen road crossings in Roy, motorists readily stopped to allow me to cross safely! I appreciate your good driving manners and safety attitude. Perhaps you could train the drivers on 300 N in Clearfield at the Burton Street crossing. They could use some of your good nature. Week 2 passed without a ride — the weekend was filled with Timpanogos Storytelling Festival. Week 3 nearly passed without a ride, but I got home from Oregon in time for a ride. Today I rode 13 miles at a good pace. I could feel the old body starting to work again. I declared I’ll ride 100 miles on my 60th birthday. I’ve got just 217 days to prepare! Yesterday I rode 30 miles – a bit much – on the Denver & Rio Grande Rail Trail. The ride was from Clinton to Farmington and back. I rode more than I should have, because I was curious whether the trail had finally been extend to connect with the Legacy Parkway Trail. Indeed it has! I’m very fortunate to have such a trail just a half mile from the house. That makes about 30 miles of connected trail (and 60 miles round trip). I should get to the sixty mile ride before the snow flies! 1) I’ve come to the certain knowledge that in just a few weeks I’ll reach the age of 59.5! No big deal except that it is an age canonized in IRS regs — somehow related to IRA and 401k distributions. I don’t need to get into that because my accounts amounted to little a few months ago and even less today! 2) Perhaps more auspicious is the signal event of 60.0 in a few short months. 3) A number of years ago, I read a health article which suggested that the decade of the 50’s was the last chance for people to “get in shape!” At least statistically, folks who are not in shape on their 60th birthday, are more prone to health declines in their 60’s and 70’s. I took that to heart. I took off 60 pounds. I rode the bike. Even rode 100 miles in the Salt Lake Century. That year, I rode the bike more than 3000 miles. But I haven’t been so kind to my body these past 3 years. 30 pounds are back and I’ve ridden less than 300 miles all year. 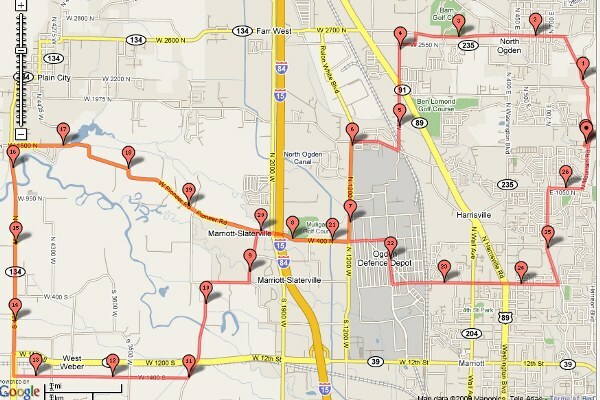 I proclaim that on April 1, 2012 — the 60th anniversary of my birth — I will ride the bicycle 100 miles. I’d better get to training! Just kidding! The weather’s been poor, and I’m out of shape. But today was the Salt Lake Century ride. I chose to honor the event by getting on the bike and riding. 32 miles was plenty for the out-of-shape old guy. I decided that for 2010, the nearby Antelope Island ride was too good to ignore. I bought an annual state park pass and an Antelope Island causeway pass so that I could do the ride as often as I please without being peeved about the $3 fee. Since I paid $85 on the deal, I guess I’ll need to ride 85/3 = 29 times. at 32 miles per trip thats 29*32 = 928 miles. That will help the old guy to feel younger. It was a beautiful afternoon. Is it the last spurt of Summer? At 85 degrees, I think maybe so. I don’t ride out to Antelope Island often, just because it burns me that the State Park wants $3 for a bicycle and rider. Oh well, I still wanted to go. This is today’s ride, and a shot on the island taken with my phone. This is today’s view looking north from the north of the island. It seems to capture the landscape’s ethereal nature. 1 horsefly bite. Those creatures are vicious! While riding at 15 mph, they’d pace me looking for an opportunity. 4 other people outside their cars! So you think you’re gonna ride the SLC Century? Last week I rode my first 20 mile ride of the season. Foolishly, this week I asked my friend Troy if he’d like to go on 20 mile ride with me. I’m beat. Not quite the athlete stud I’d like to be! A couple of problems here. I let Troy determine the route, which turned out to be 27 miles, not 20 miles. I’m carrying an extra 20 pounds THAT NEED TO GO AWAY! When I got up yesterday, I decided to encourage spring a bit by shaving off my beard. It worked! Yesterday afternoon the sun came out and snow began to melt. It was in the mid-40’s when I got home at 4. I installed the mesh seat that Terri repaired in November. I pumped the tires up to 90 PSI and I got on my bike and went for a ride! I rode like the wind. Well, not quite. The bike wanted to go fast, but my body didn’t. 2.5 miles, and I was well … I was pooped. 3 months of no riding just is not a good training program. But I sure felt alive afterward! Clean air and ice-free roads are coming soon. Let’s ride!